Single-frequency vs. multiple longitudinal modes Based on spectral properties CW lasers are categorized as having multi-longitudinal modes or single-longitudinal mode, in other words - single-frequency. Depending on cavity length, applied filters, and other parameters, both diode and DPSS lasers can exhibit either SLM or non-SLM spectral characteristics. In the case of single-frequency operation, the total spectral bandwidth is in the picometer or even femtometer range and is often expressed in bandwidth FWHM (GHz) instead of wavelength FWHM (pm). Another important parameter of SLM lasers is SMRS - abbreviated from Side Mode Suppression Ratio. This parameter shows, how much other longitudinal modes are suppressed with respect to the main mode, which is amplified. In any case, the other side modes are radiated as spontaneous emission or amplification with just several roundtrips in the cavity. SMSR of around 50 dB is considered suitable for SLM diode lasers. Fig. 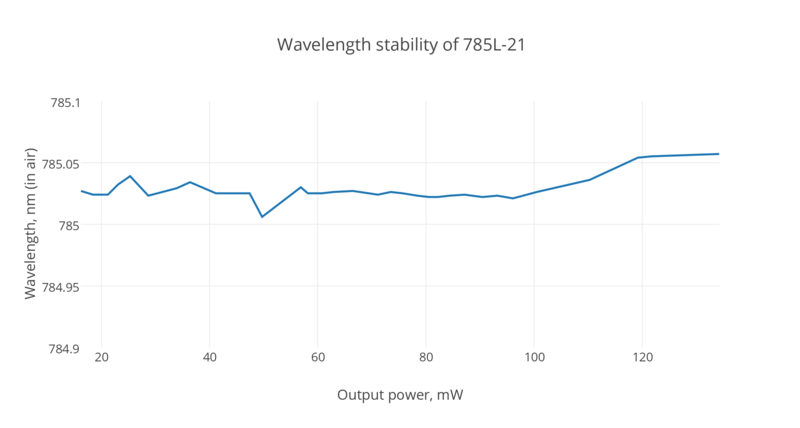 1 Spectrum of 405 nm single frequency laser measured with YOKOGAWA AQ6373. Actual linewidth is smaller since the measurement is limited by 10 pm resolution of the spectrum analyzer. Measured in logarithmic scale, side mode suppression ratio (SMSR) ~49 dB. Fig. 2 Spectrum of non-SLM 405 nm laser (simply collimated laser diode). Measured with YOKOGAWA AQ6373, 10 pm resolution. The spectrum contains hundreds of longitudinal modes spaced apart by ~30 pm. The total linewidth is about 0.46 nm. High-end applications like Raman spectroscopy often require more than 50 dB SMSR or just a cleaned-up spectral line. To achieve this, various techniques may be used, the most simple one is to install a laser line clean-up filter. Such interference coating based clean-up filters are available from stock from major filter producers. Below we show the spectrum of Integrated Optics' 405L-21A laser with and without the clean-up filter. Fig. 3 The spectrum of 405L-21A single frequency laser from Integrated Optics without a clean-up filter. Side-mode suppression ratio (SMSR) ~52 dB. Fig. 4 Spectrum of 405L-21A SLM laser (the same laser as on the left side) with a clean-up filter installed. The SMSR is increased to ~66 dB or even more (limitation of the dynamic range of the spectrum analyzer). There are several techniques for achieving SLM operation of diode lasers. Most of them are related to a use of periodic modulation of refractive index, thus creating a Bragg Mirror, which reflects or seeds back some portion of radiation back into the laser cavity, but the reflected radiation features very narrow linewidth. Few of the most popular principles are FBG (Fiber Bragg Grating), VBG (Volume Bragg Grating), DBR (Distributed Bragg Reflector), and others involving the use of reflective or transmissive grating in popular Littrow or Littman configurations. 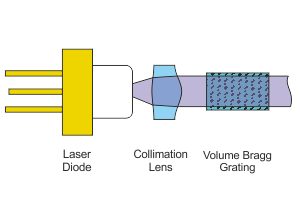 The majority of these techniques can be summarized with one term - ECDL (External Cavity Diode Lasers), except DBR, as will be explained further on. Integrated Optics offers mainly VBG based SLM diode lasers. This is chosen for multiple of reasons. First of all, this concept allows making SLM lasers based on low-cost conventional laser diodes in a variety of wavelengths, as opposed to DFB (distributed feedback) lasers, for example. Secondly, such design is space saving and can be incorporated in very compact housings, which is not the case of DBR using holographic reflection gratings. A combination of miniaturized precision electronics, proprietary micro-assembly technique, and VBG optical design allows us to make the most compact SLM laser modules on the market. Single-frequency lasers are often used in applications requiring high coherence length, such as holography. Even more popular application is Raman spectroscopy. Narrow linewidth and overall central wavelength stability are important characteristics of such lasers. For example, VBG stabilized single-frequency lasers typically feature central wavelength stability of less than 10 pm at constant output power. Wavelength stability parameter really depends on how the laser is designed - if it has precision temperature stabilization, what is the noise of the power electronics, how robust it is against environmental conditions, such as temperature change or mechanical stress. SLM diode laser made by Integrated Optics feature less than 10 pm central wavelength stability in a temperature range from 15 deg. Celcius to 35 deg. C.
Limited output power tuning. When using ECDL concepts, the laser diode is seeded back with part of the radiation, but the seed has a very narrow linewidth. In order to stabilize a laser at a desired central wavelength, the original spectrum of the laser diode must also emit some radiation in that particular wavelength - otherwise, there will be not sufficient useful radiation to reflect. It is widely known that it is possible to tune the central wavelength of a laser diode by changing temperature or output power. Change of either of these results in change of actual temperature of the emitting area of the laser diode, which effectively changes the wavelength. This is so-called thermal wavelength tuning. The cooler is the emitter, the lower wavelength is emitted and vice versa. Here comes the limitation of the power tuning for SLM diode lasers - once the power is decreased or increased, the natural central wavelength of the laser diode is shifted towards blue or red region respectively. Once the natural emission spectrum does not sufficiently cover the desired stabilization wavelength, the locking is lost and the diode might no more be stabilized. This means that the power tuning range of ECD lasers is often very narrow and in each case depends, what is the initial equilibrium - if the desired wavelength is well matched with natural spectrum of the laser diode at reasonable temperature, e.g. 25 deg. C.
Such quite favorable condition is represented in the graph above on the right. This particular laser had quite good overlap of the reflection wavelength of the VBG and natural emission spectrum of the laser diode, thus tuning from 20 mW to 120 mW was possible without loosing SLM operation. On the other hand, when output power is changed, center wavelength stability is much worse than 10 pm. Limited ON/OFF modulation. SLM lasers are sensitive to change of temperature in the emitting region, as explained above. In case the laser is modulated in an ON/OFF mode, the average output power decreases, so does the emitter facet temperature. This results in wavelength shifting - very similar to what happens in simply changing the output power of the laser. If the natural spectrum of the laser diode is shifted too much, no more SLM behaviour is to be expected.